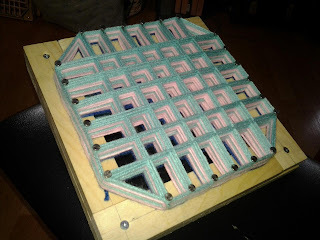 A few days ago in the ICH Office we tried our hands at making a small pillow top frame. The plan is to use the smaller frames in workshops, particularly with younger kids. It currently takes about 4 hours to complete a pillow top on the large frame. Using the small frame, the pillow top can be completed in about 2.5 hours, making this activity much more accessible. Our small frame turned out well and the end result is a cute little pillow top, with very fluffy pom poms, that can be used as a trivet or table topper. Several of these mini pillow tops could be sewn together to make a blanket. After receiving a few requests, I decided to put together this step-by-step guide for making your very own pillow top frame. Take four pieces of wood and arrange to form a square. Add a layer of wood glue and place the other four pieces on top. Using the drill, insert screws into the end of each piece of wood, as seen in the picture below. Before this step you may need to clamp the pieces together and put aside while the glue sets. Using a ruler and pencil, draw a line down the middle of each side of the frame, lengthwise. Then along this line, mark off, in even spaces, where you will hammer in your nails. Space the nails about 1 inch apart. Drill holes in each of these markers to make it easier to hammer in the nails. Hammer 6 nails into each side. Make sure they are even. Leave about half the nail sticking out of the frame. Once all the nails are all hammered in you can start weaving! If you have any questions about how to make your frame or are interested in having us put off a pillow top workshop in your community, feel free to get in touch with Nicole at (709) 739-1892 ex. 6 or via email at nicole@heritagefoundation.ca.